Because when it evolved 300 million years ago, roads weren't a threat. So the turtle's armored shell kept out most predators. Its swimming skills provided plenty of food. And its ability to breathe through its skin made amphibious existence a snap. In these modern times, most Montanans see turtles as a greasy smear on highway asphalt. That's a shame, because the indigenous western painted turtle lives true to its name. Fine yellow lines accent its shiny green carapace, or shell. Their heads, when they stick them out, are a crazy quilt of green and yellow. It's on the turtles' plastron, or underside shells, that they really earn their name. Each has a unique, vivid pattern of orange, black and green designs. Chrysemys picta bellii is the only turtle native to western Montana, although the eastern half of the state has a snapping turtle and a soft-shelled turtle species. 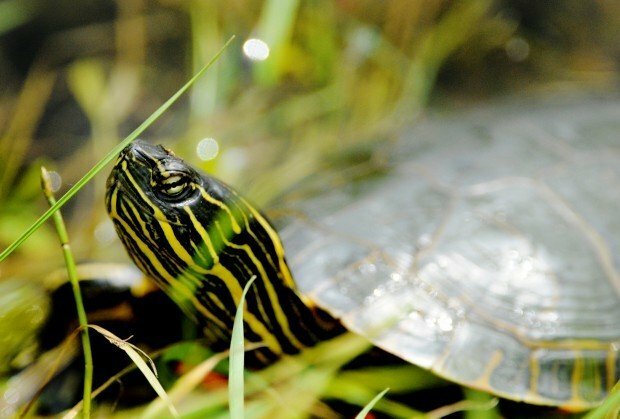 Occasionally, one might see a box turtle or a red-eared slider, but those are probably escapees from a classroom or pet shop. Painted turtles have some secrets they won't give up easily. Kathy Griffin learned that when she spent years studying them in the Ninepipe National Wildlife Refuge ponds near Charlo. "I had one pond with 230 turtles, and it went dry," said Griffin, a post-doctoral researcher at the University of Montana. "I couldn't find those turtles anywhere, and they were all marked. I started searching in concentric circles from the dry pond, and finally found 32 of them in a pond a mile away." This year, that old pond has refilled. And the only turtles that have returned are the ones Griffin marked five years ago. "I don't know where they went," she said. "Obviously, these turtles know this landscape. And the only ones I found were adult females. Why? There are just more questions than answers." One answer Griffin did find was that turtles change pond types as they age. 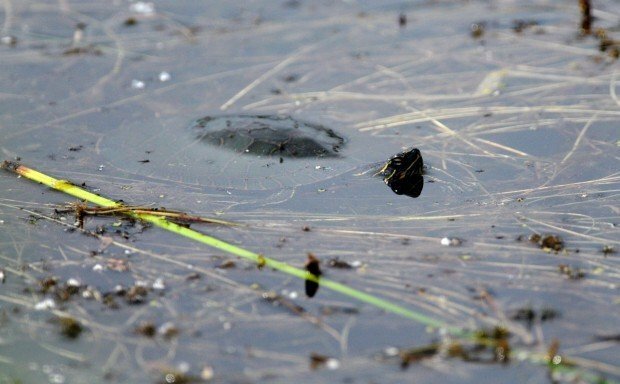 Juvenile turtles prefer small, shallow waters, while bigger adults like deeper ponds. That's significant, because it explains why turtles are often crossing roads. They're moving to more appropriate habitat - which unfortunately is often separated by human development. Painted turtles show up in lots of unexpected places. They're occasional spectators at Missoula golf course water hazards. Dozens of them float on logs in the sloughs and island channels of the Bitterroot River. They also populate the fens and bogs along the Seeley-Swan lake chain. The ones you're likely to see range in size from a cheeseburger to a squat teapot. Despite their slow reputation, they can scoot off their basking banks faster than you can sneak up on them. "See here where the grass is trampled - that's where they've been basking," said U.S. Geological Survey zoologist Steve Corn, as he scouted the edge of a pond at the Linda Vista Golf Course. With the recent high water levels, most of the logs they like to sit on have been pushed into the reeds or floated away, so the turtles have been clinging to steep pond banks. Their glistening shells make them stand out from shoreline rocks - but just barely. Once they reach that size, not many things mess with painted turtles. Foxes and skunks will harass them and try to get a morsel out of the shell, as will blue herons. It's the eggs and juveniles that suffer most. Scavengers will dig out their nests or gobble up the babies while their shells are still relatively soft. Corn's wife and fellow biologist Janelle Corn has been trying to learn what happens to those babies. She's looked in the bellies of bull frogs and large-mouth bass, but found nothing in those usual suspects. Up at Ninepipe, the ponds have relatively little fish or other aquatic life, although birds are a likely threat. "They don't serve as a big food base for much of anything," said Dale Becker, wildlife manager for the Confederated Salish and Kootenai Tribes. "You'll see herons picking up little guys once in a while. But for most species, when they get a bit of size, they're more trouble than they're worth. They've got a pretty good defense mechanism." That inedible shell allows mature turtles to live 20 or 25 years in the wild. Unlike land tortoises, painted turtles can roll themselves over if they get flipped upside down. And they seem to have plenty of other tricks to survive. But it helps to have friends higher up the evolutionary scale. Human engineers and scientists are trying to design a barrier that will keep turtles off highways without discouraging their necessary migrations from pond to pond. Those ideas will be put in play in a few years when the Ninepipe section of U.S. Highway 93 gets rebuilt, probably around 2012 or 2013. "For little slug guys like they are, they seem to be able to just take off, and turn up someplace else," Becker said. "They seem fairly simple, but when you look at them a little closer, they're a whole lot more complex."